Acute or chronic cough with build-up of yellow phlegm with signs of barking or rattling cough and difficulty breathing. acute bronchitis, pneumonia and pertussis. 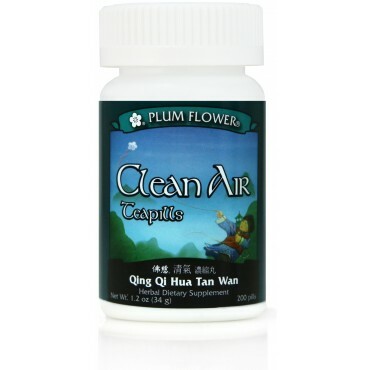 Also useful in chronic asthma and emphysema due to phlegm heat are some of the imbalances satisfied clients have used this product for. Pinellia ternata rhizome, Arisaema c-u-m bile, Trichosanthes kirilowii seed-frost, Scutellaria baicalensis root, Citrus reticulata peel, Prunus armeniaca seed, Citrus aurantium fruit-immature, Poria cocos fungus, Zingiber officinale rhizome-fresh, Botanical wax, Talcum. - Ban xia, Dan nan xing, Gua lou ren shuang, Huang qin, Chen pi, Xing ren, Zhi shi, Fu ling, Sheng jiang, Botanical wax, Talcum. Contraindicated for Yin deficient chronic cough, cough without phlegm or cough with thin watery sputum. Use with caution during pregnancy. Contains tree nuts.